Happy new year together and I hope you had a great transition. A new blogger year is coming up and I try to sweeten you this with refreshing rarities. 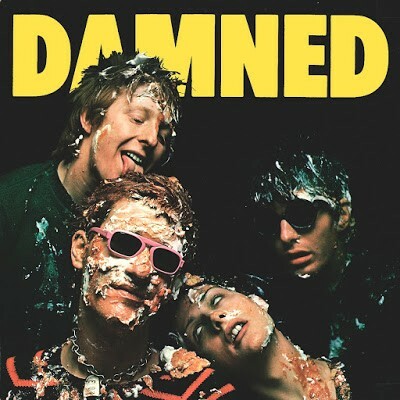 At the start now: Damned Damned Damned, the debut album by London’s The Damned and it was released by Stiff Records and allows me a short info from wiki: In a contemporary review, NME praised the group’s musical ability, opining that the Damned have “all the residual skills needed for the actual performance of exhausting modern music”, stating that James was the most effective powerhouse guitarist since Pete Townshend and concluding that the album as a whole was “a highly professional production and is much more convincing than some other new wave bands I’ve heard on record.” BBC’s retrospective review praised the album’s energy, pop satire and general humour, commenting, “Each track featured the hammering toms of Rat Scabies & Captain Sensible’s bass-as-guitar propelling Brian James’ exhilarating machine gun axe into your living room”. The American press has also favored the album. Ned Raggett of AllMusic gave it their highest rating of five stars, calling it “a stone classic of rock & roll fire” and declaring that “Damned Damned Damned is and remains rock at its messy, wonderful best.” Pitchfork also positively assessed the album in a negative review of the Damned’s 2001 album Grave Disorder, stating, “I won’t lie to you: the Damned’s new album isn’t very good. In fact, the Damned have only ever recorded a few albums that were – for instance, their debut or 1979’s Machine Gun Etiquette“. Okay, now I’m looking into my treasure chest which album will be my first rip 2019.